Update 1.61 "Road to Glory"
Update 1.61 "Road to Glory"(changelog) was introduced on 03 August 2016. Mechanism of returning to a battle after being disconnected from the server has been implemented (will be added later). Season system for Squadron Battles has been implemented. Matilda Mk.II - Armour model of the front part of the hull has been refined. Pz.Bfw.VI (P) - Placement of radio modules has been changed (has been moved to the drivers compartment). Placement of fuel tanks has been changed (fuel tank on the floor of the crew compartment has been removed, volume of fuel tanks in the engine compartment has need reduced). MG131 - Values of armour penetration have been refined. Up to a distance of 100m - it has been increased. Over 100m - penetration falloff is now less pronounced than before.Source: Handbuch der Flugzeug Bordwaffenmunition, 1936-1945. .50 Browning, aircraft - Values of armour penetration for shells M2, M8, M20 have been refined (decreased). Source: MIL-C-3066B, 26 February 1969. TM9-225 - Browning Machine Gun Caliber .50, AN-M2, Aircraft, Basic, January 1947. MG151/20 - Values of armour penetration for shells have been refined: APHE - decreased; AP and incendiary - increased. Source: Handbuch der Flugzeug Bordwaffenmunition, 1936-1945. L.Dv. 4000/10 Munitionsvorschrift für Fliegerbordwaffen, 1944. Sd.Kfz.6/2, Ostwind, Coelian - New, more powerful HE shell with increased filling - M.Gr.18, has been added to the available ammunition. M48A1 - Fire rate of the M41 cannon has been fixed (reduced) from 11 shots/min to 8 shots/min. PT-76B - Fire rate has been corrected (decreased) to 7 shots per minute. Source: “Guide to the materials and operation of the PT-76 and PT-76B”. Military Publishing House of the Ministry of the Defense, USSR, 1967. B-17e, B-17e/L - The “Engine injection” modification has been removed according to the new flight model settings (compensation will be given for those players who already researched the modification). SB-2 M-105/Ar-2 - The “Engine injection” modification has been added according to the new flight model settings. He-112-A0 - The “Engine injection” modification has been added according to the new flight model settings. Extent of aircraft engine overheating has been changed. Light yellow - moving beyond working temperature. Yellow - close to overheat. Engine sounds on other aircraft can be now set up in the engine sound settings. Cockpit bailout with parachute has been dubbed. Aircraft crash sounds have been improved. Sources of the J7W1 engine sounds are now located respectively to the engine position. Sounds for aircraft armament have been fixed. New sounds for the 20mm Flak38 cannon have been added. The stun effect when a tank crew has been hit has been added. Colour identification of temperature levels has been changed. Red mode indicates that the engine is overheating. Yellow means that the engine is operating in limited mode (working time less than 5 minutes, but longer than 2 minutes). Pale yellow is for prolonged limited mode (less than 10-15 minutes, but longer than 5 minutes). Fiat Cr.42, I-15 (all modifications), Swordfish Mk.I – Flight model has been reworked. Vibration and stability damping has been considered. Engine-propeller-system has been updated. Fuel consumption priority has been switched on, thermodynamics have been updated. Pe-8 М-82 - Pitching moment in level flight has been reduced. Fuel consumption priority has been switched on, thermodynamic have been updated. FW-190-D, Ta-152 (all modifications) - Calculation for the flaps has been corrected, critical angle of the airflow by releasing the flaps. Easier landing with partial fuel load. He-112-V5/A0 - Flight model has been reworked. Vibration and stability damping has been considered. Engine-propeller-system has been updated. Fuel consumption priority has been switched on, thermodynamics have been updated. The character of stall has been changed (now a stall can occur abruptly, almost without warning). B-17E, B-17E/L - Flight model has been reworked. Additional fuel tanks has been removed. Engine operating logic has been changed: 100% for take-off/battle actually corresponds to 83% in reality. Emergency mode (WEP) is absent. B-17G - Flight model has been reworked. Separate fuel consumption has been switched on. Additional fuel tanks will be filled last and used first. Engine working logic has been changed: 100% for take-off/battle actually corresponds to 83%. Emergency mode (WEP) has been added - 1380 h.p. B-29 - Flight model has been reworked. Engine working logic has been changed: 100% for take-off/battle actually corresponds to 92%. New emergency mode (WEP) has been added - 2500 h.p. Тu-4 - Heaviness of ailerons at high speed has been decreased. F4U-1 (all modifications) - Engine, propeller characteristics have been adjusted. Weight has been updated, pylon air resistance in no pylon configuration has been removed. F7F-1 - Thermodynamics have been updated. Р-47 (all modifications) - Thermodynamics have been updated. Heating occurs slower, radiator automatic cooling adjusted to maximize the time radiator shutters remain closed. SB-2 M-105/ Ar-2 - Thermodynamics has been fixed. Boost mode has been enabled. P-47N - Has been initially configured according to the data sheet. Ki-100 - Has been initially configured according to the data sheet. Textures for destructible objects in locations for ground vehicles has been fixed for graphic settings “Compatibility with older graphic cards”. 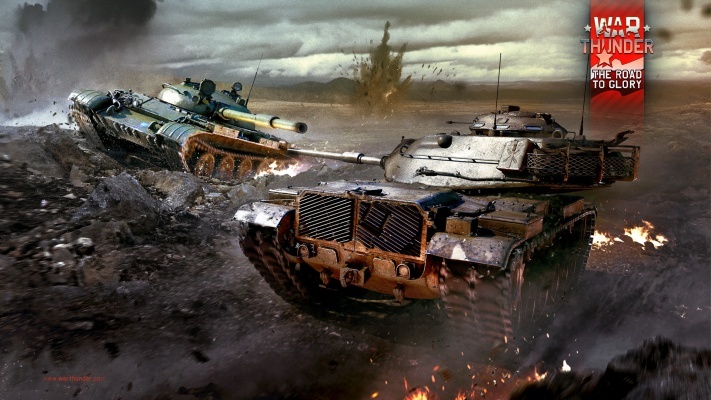 The conditions for obtaining camouflage for the M60 and M60A1 has been fixed (increased). Bug where in rare cases a crew member didn’t switch to gunner position has been fixed. Negative climb rate values for some aircraft in aircraft cards have been fixed. Linux: Crashes on launch on some system configurations has been fixed. Control performance in AB of the following ground vehicles has been improved Pzkpfw III ausf E, Pzkpfw III ausf F, Pzkpfw III ausf J, Pzkpfw III ausf L, Pzkpfw III ausf M, Pzkpfw III ausf N, Pzkpfw II ausf H, A 34 comet, M18 hellcat, M22 locust, M2 medium, M2a4, M3a1 stuart, M8a1, BT-7 1937,T-50. LVT(A)(1). Arcade boosts for mobility have been reduced, thus engine power values have changed for some of these vehicles. The penetration of german 150 mm HEAT ammo has been fixed - it is now 160mm instead of 250mm. Gun barrel material type for Coelian SPAA and T-62 tank has been changed. Rare bug where a player received 10-15% RP less than should have been awarded has been fixed. Historical campaign progression has been fixed. In this update we will be implementing changes to the mechanics of how specific identification marks (decals) may be used on vehicles. From the update on you will only be able to apply identification marks of the 5 main nations (such as stars, crosses etc.) to the vehicles of these nations respectively. Fixed a bug where the MGM61b (Shillelagh) missile had an excessive deflection from the point of aim. This page was last edited on 18 February 2019, at 20:34.